Tooth-billed Bowerbirds are the only bowerbirds in Australia that don't build a bower in the traditional sense. Instead, near the centre of their territory, where males sing and display to prospective mates, they maintain a cleared area on the rainforest floor of about 2 to 5 square metres known as a court. 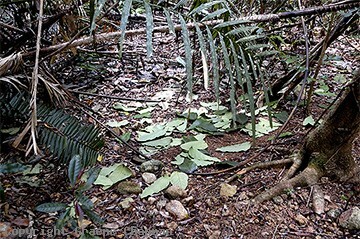 Here they regularly place large, upturned leaves pale side up (see pic 678205D). Toothbills, as they are popularly known, occur in the Wet Tropics of NE Queensland between the Big Tableland near Cooktown south to Mt Elliot just west of Townsville. They live deep in the highland rainforests mainly between 600 and 900 metres a.s.l. 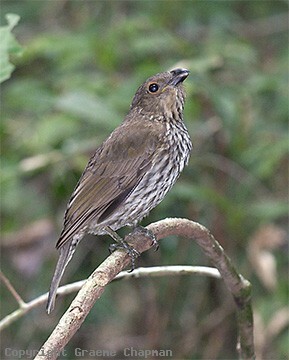 Like other bowerbirds they are quite long-lived - up to 24 years old has been recorded. Adults are sedentary and live permanently in home ranges of about 10 Ha and in good habitat, courts may be found at between one and two per hectare. Court sites are traditional and are maintained in much the same place year after year. In the breeding season, males spend more than half the day singing from a perch near their court. 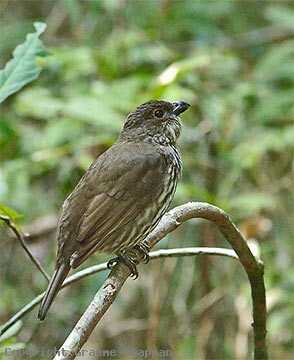 The song is loud and varied and is one of the principal sounds of the upland rainforests (listen on sound page). They are also expert mimics - more than 40 species have been recorded. Toothbills are predominantly vegetarian. The notched tip of the mandibles is an adaptation to cutting and manipulating the leaves and soft tissues of rainforest flora but like other bowerbirds, they also eat a lot of fruit. Males are polygynous, that is they may mate with several females in succession. Females alone build the nests and look after the young - nests are usually well off the ground (between 8 and 27m) and often located in a tangle of vines. 678201-D ... Tooth-billed Bowerbird, male on song perch. 678204-D ... Toothbill males engage in sustained singing sessions. The song is very loud. 678205-D ... Instead of a bower, Toothbills maintain a cleared area with broad upturned leaves.